F1 great Michael Schumacher's former boss at Ferrari has said the latest news about the German's health "is not good" but has refused to elaborate. "I have news and unfortunately it is not good," Luca di Montezemolo told reporters on Thursday. When contacted by BBC Sport, Schumacher's official spokesperson Sabine Kehm declined to comment. Seven-time world champion Schumacher, 47, suffered severe head injuries in a skiing accident in December 2013. 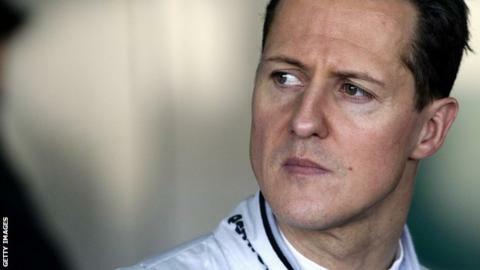 Schumacher continues to receive intensive treatment at his home in Switzerland following the accident in France. In November, FIA president Jean Todt said Schumacher was "still fighting", almost two years after the accident. "Life is strange," added Di Montezemolo. "He was a fantastic driver and only had one accident with Ferrari in 1999."